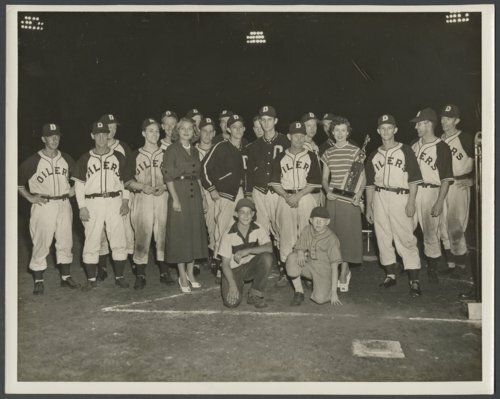 This photograph from 1950 shows members of the Topeka Decker Oilers during the trophy presentation ceremony following the team's second-place finish in the state semi-pro baseball tournament in Wichita. The team lost the July 28, 1950 championship game to the El Dorado Elks by a score of 8-5. Individuals standing in the photo include (from left to right): Bob Crites; unidentified; outfielder Harold Senne (face partially obscured); second baseman Don Farmer; unidentified; unidentified woman; unidentified (face almost entirely obscured); outfielder Ray Johnson; pitcher Harold Graham (face partially obscured); pitcher Junior Coffman (wearing jacket); unidentified; pitcher Burt Coffman (wearing jacket); manager Vern Coffman; outfielder Ray Hickey; catcher John Burkhardt (face partially obscured); unidentified woman; left fielder Ed Coffman; first baseman Butch Nixon; and, shortstop Don Kirkwood. The boy kneeling on the left is unidentified; the boy kneeling on the right is Ed Coffman's son, Butch. During the late 1940s and 1950s, the Decker Oiler team was a perennial contender for the state semi-pro title, competing each year in the state tournament. The team won the state championship in 1948, placed second in three consecutive years (1950-1952), and finished third in 1955 and 1957. Digital reproduction of the photograph was accomplished through a joint project sponsored by the Kansas Historical Society and the Shawnee County Baseball Hall of Fame.